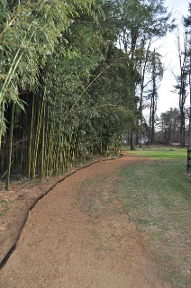 We use high quality HDPE barriers that are specifically designed for bamboo. 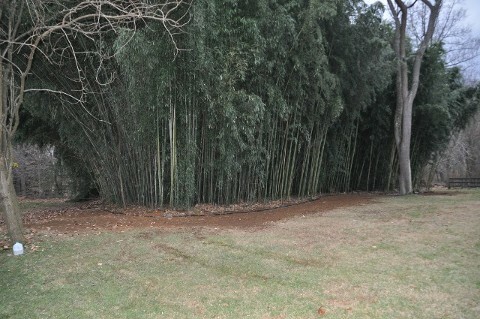 The barrier acts to deflect the rhizomes, preventing the bamboo from spreading into unwanted locations. 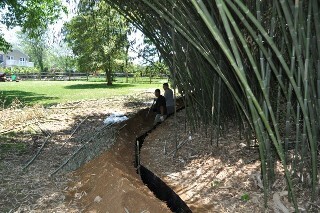 CC Bamboo only uses 80mil HDPE barriers. 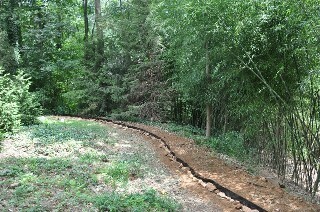 Other companies will use the less expensive 60mil material, which has far less puncture resistance. 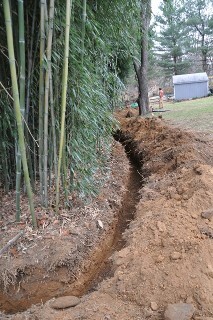 We don't just dig a trench and toss the barrier in. 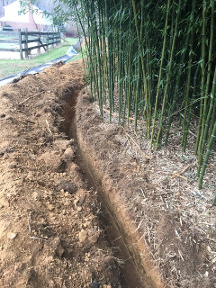 We carefully measure the depth of the trench as we go and then thorughly dry fit the barrier to make sure that the height above ground is consistent and level. 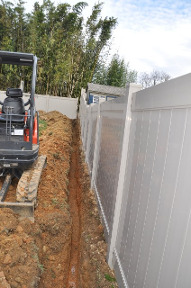 The side wall is then inspected for any roots or sharp rocks that could puncture the barrier overtime. 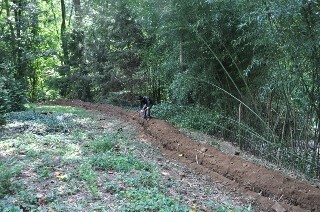 Back filling the trench takes time to ensure that the barrier sits straight without twists and curves. 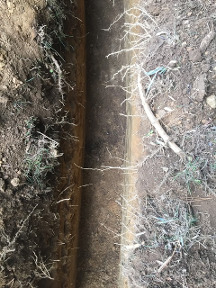 Proper compaction both mechanically and manually is the only way to prevent settlement and or erosion caused by voids left on either side of the barrier. 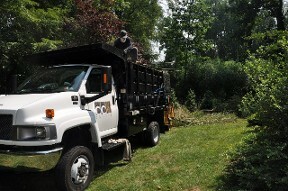 Suffice to say, we take pride in the quality of our work. 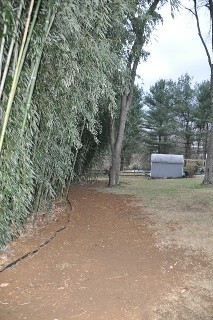 There are many situations that only require the bamboo to be controlled on one side. 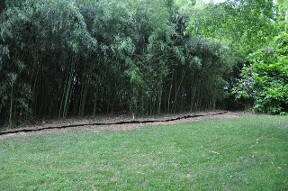 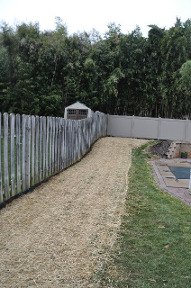 A single sides barrier is best for a larger yard, where the area in front of the bamboo can be mowed or edged to keep it within the desired area. 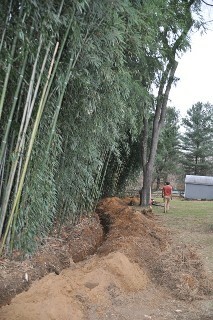 It should be noted that rhizomes can easily spread 20'-40' from the original planting. 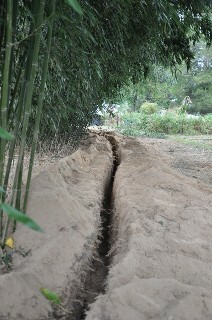 By mowing the new growth, the rhizomes remains viable underground. 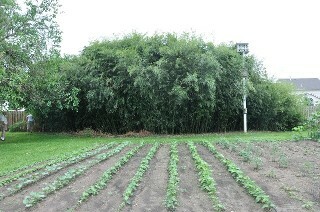 Therefore, if your vegetable garden is only 10' from the bamboo, you would need to edge the rhizomes, to prevent them from sneaking into that area. 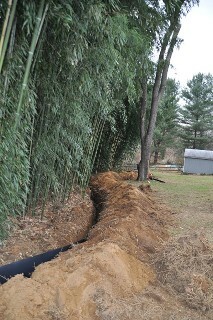 This method does have a few long term benefits, since the bamboo will be less congested and better able to release energy. 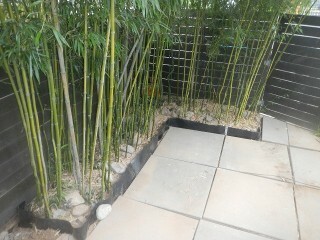 A double sided barrier completely surrounds the bamboo and is bolted together at the seam. 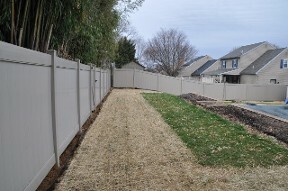 Double sided barriers are the best option for smaller planting areas. 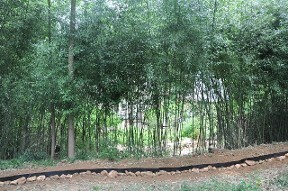 Since the bamboo is contained to a predetermined area, it is more likely to become congested. 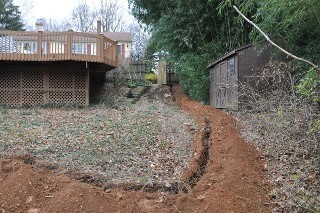 This can take years to happen, but should be noted as nothing is truly maintenance free. 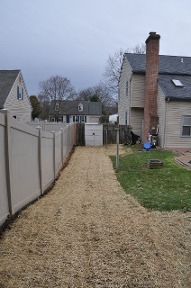 Note: Over the years, people have come up with some creative barriers. 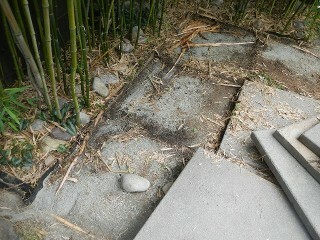 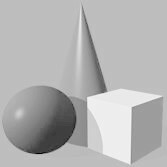 The simple fact is that most materials break down quickly when buried in the ground. 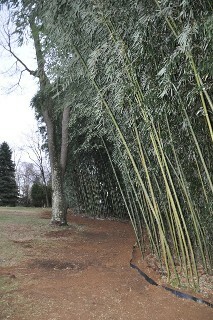 Any seam or crack that the bamboo comes across, it will find a way through. 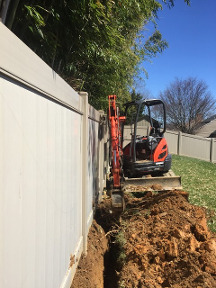 This is why we strongly advise against the use of other materials such as; metal "rust", concrete "cracks", rigid panels "seams". 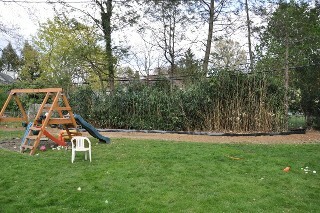 We installed this barrier in 2016. 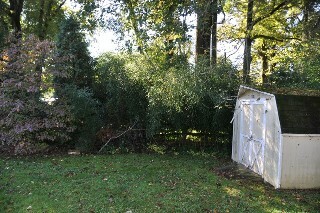 This was a referral from a current client. 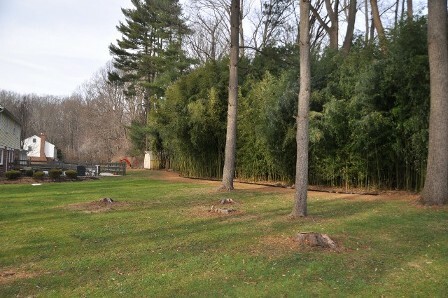 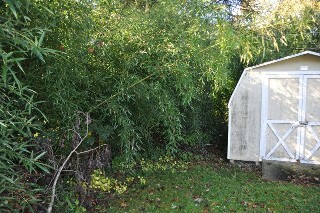 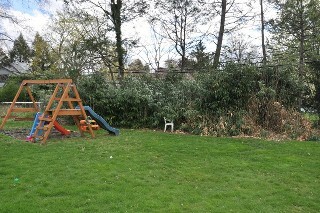 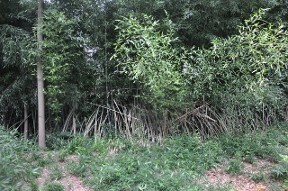 The bamboo spreads across several yards and the neighbor to the right of this property was not interested in participating. 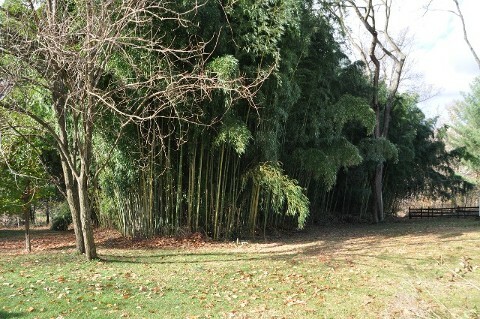 The neighbor on the left however was happy to see us as the bamboo was just getting to his yard. 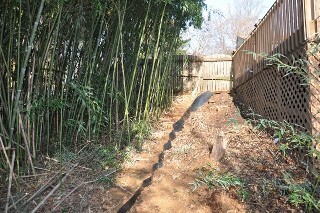 We extended the barrier along the right side of his property to flank the corner and prevent the bamboo from spreading any further in that direction. 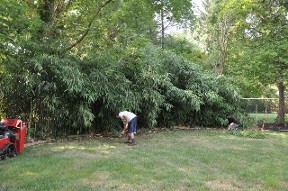 Our client battled the constant invasion of this bamboo for years. 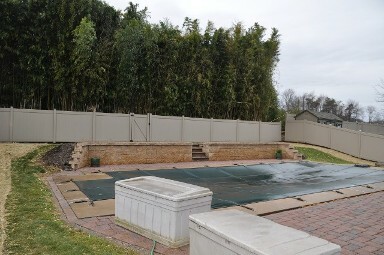 He initially called during the busy Spring months but patiently waited until we were able to get there, so he knew the project would be done correctly. 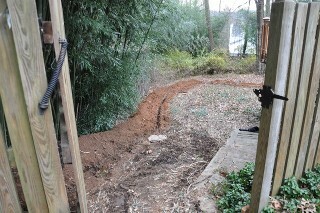 The yard slopes up behind the pool, which made this project challenging because of the frequent elevation changes. 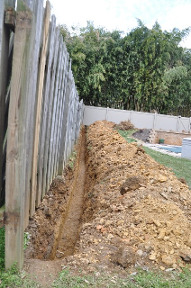 We took our time to make sure the trench was dug to work with the changes in elevation and the end result was a perfect installation. 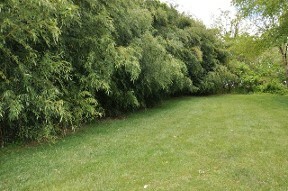 This is a very large grove that had not been maintained for years. 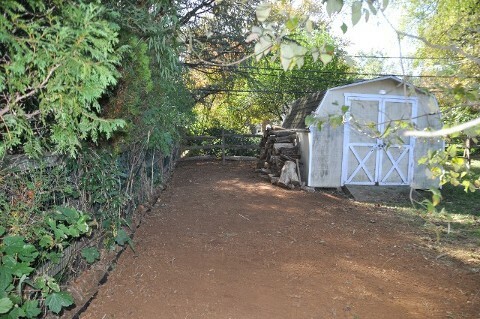 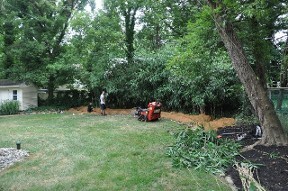 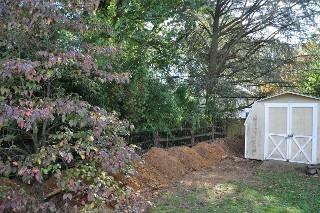 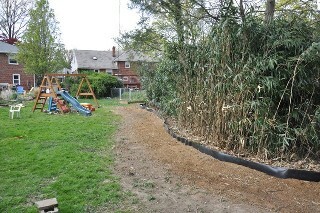 We spent 2 days cleaning the grove and then installed a root barrier to prevent further encroachment into the yard. 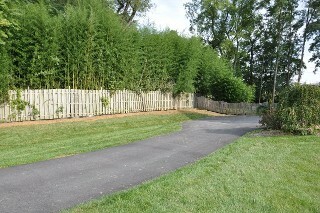 Rather than installing a straight barrier we contoured it to match the natural lines of the grove. 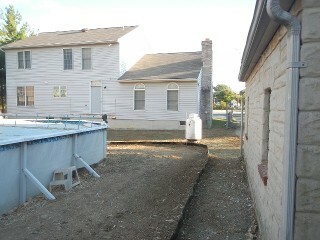 We have done maintenance for this client in the past. 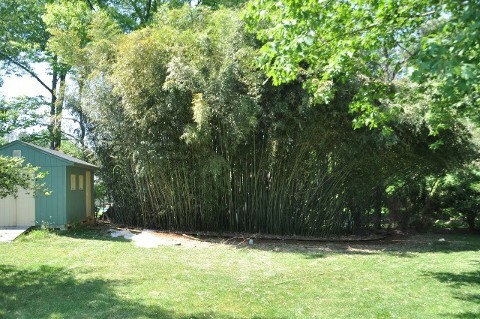 They decided it was time to contain their grove of bamboo before it could escape into the neighbors yard. 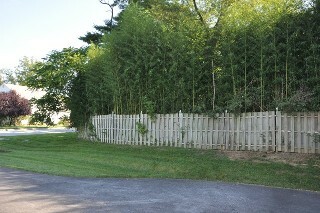 This grove looks great and makes and excellent privacy screen. 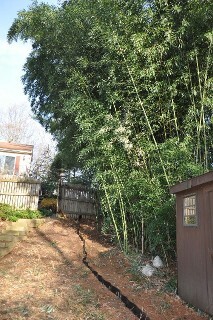 The bamboo entered our clients yard from the rental property next door. 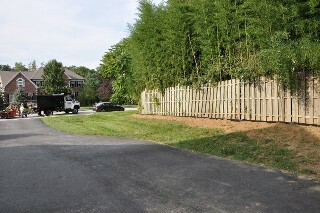 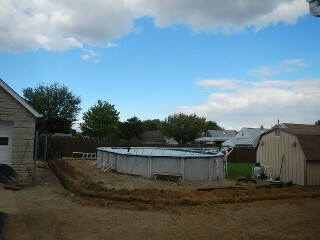 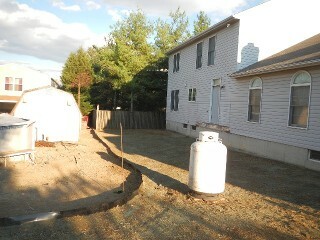 As with many projects the neighbor behind our client wanted our help as well. 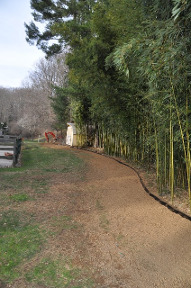 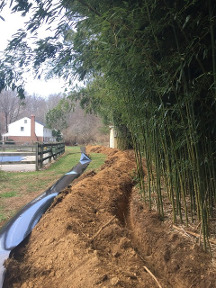 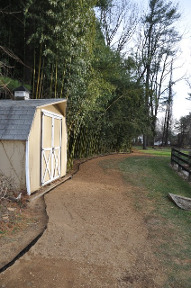 We removed the bamboo that had spread onto both properties and then installed a root barrier along their side yards to prevent any future encroachment. 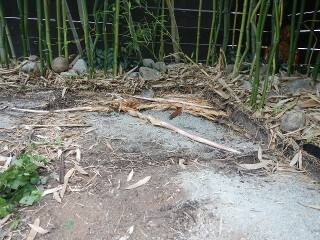 This is why root barriers should only be installed by a specialist. 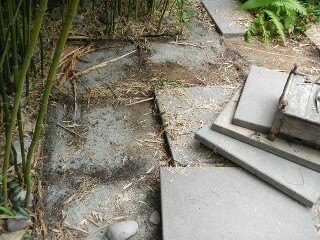 Awesome family hoodwinked by Landscape designer. 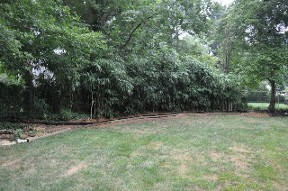 This client had a beautiful backyard done by a landscape designer. 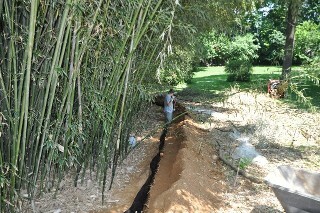 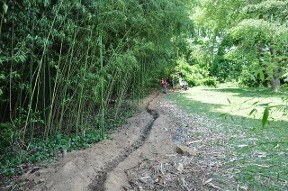 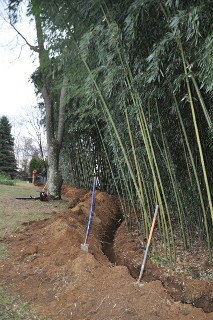 The designer then had a few laborers install a root barrier around the bamboo. 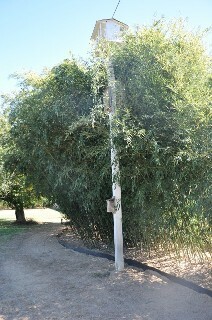 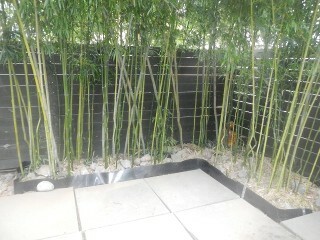 A short time later the bamboo jumped the top of the barrier and the client had the designer return to fix the problem. 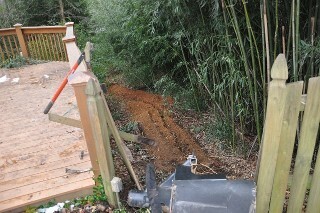 Unfortunately, they made a bad situation worse. 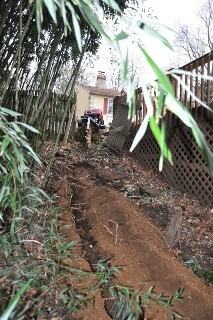 We were called in to solve the problem and even I was surprised at how bad the situation was. 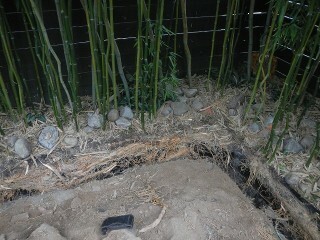 The are had to be excavated and the barrier had to be replaced. 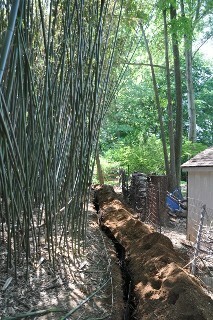 CC Bamboo has installed more bamboo root barriers than ANY other company.